During the spring, the leaders of the established parties have presented their vision for Sweden in 2028. The newly established Basinkomstpartiet (Basic Income Party) leader Lena Stark here presents her vision of a safer and better-functioning country. The 2018 election was a crucial election. The focus was on piutting groups against each other, on insecurity and scare propaganda, SD (Sweden Democrats) grew and the Social Democrats went astray. Many had difficulty realizing how absurd our system had become. We were told that working for a wage was the meaning of life. Unemployed people would be employed with meaningless "jobs", sick people could not be sick because the budget was insufficient, to resign from a bad job was punished with removal of a-kassa (general work insurance). The job line was considered to be a natural law, while entrepreneurs with good ideas but poor resources were kept out of the market. Preschool teachers demonstrated across the country against having to teach classes which are too large, and the healthcare staff was forced to their knees because of bad working conditions. More people than ever were sick with work-related stress. It is now 2028. We have introduced basic income in Sweden. All the positive effects of unconditional economic basic security that have emerged in the many pilot projects and studies carried out around basic income over the past 60 years have come to fruition - and many more. Even the first time I read about the concept of basic income in December 2013, I realized how it could change society radically for the better. 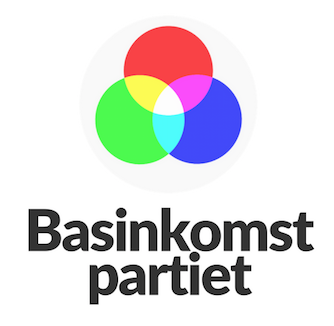 I started Basinkomstpartiet (Basic Income Party) with people from both left and right, because no other parties dared to address the issue of offering a stable social and economic security for real, one where no one could fall between the cracks, where the sick did not get insured and where people are given the freedom to grow and develop society based on their own premises. With only half a year of choice, the odds were high, but we did it! Introducing basic income was no problem. We commissioned Riksdagens Utredningstjänst (the Parliament Investigation Service) to investigate how it could be introduced gradually. Financially, careful calculations from some of the country's most skilled economists were made. The already existing funding proposals made earlier proved to be completely correct - we could afford it. We adjusted the economy to the people and the environment, not making people and the environment adjust to the economy. Technically, the Swedish Tax Agency solved it in less than a week. We were able to remove the controlling functions at the Employment Services and Insurance Office and allow the competent staff to do what they do best - help unemployed and sick on their own terms. The statistics show, as in the pilot projects, that we are working as much today as in 2018 but that the difference between paid jobs and work has begun to blur. The rural areas are populated again and many more, especially women and young people, start businesses because they can handle a smaller turnover in the beginning. More and more educate themselves or change a profession, as you do not need to take student loans. There was also a sharp increase in college students from what we used to call vulnerable areas. Personnel in health care have been able to negotiate better conditions and reduced working hours because their position has been strengthened. Unemployment has diminished as we were able to better share the workload. The public health crisis of burnout has decreased markedly, so has also mental ill health when exclusion based on economic misery has disappeared. We no longer have any children living in poverty.